We finished our annual Harry Potter reading two days before Halloween, and it was a treat from beginning to end (but especially the end). I'm so glad my boys will always link these books with the beginning of school and the anticipation of Halloween. It's so perfect. Harry's third year at Hogwarts gets an early kickoff when he lets his temper get the best of him and inflates Aunt Marge. He runs away and fortunately gets picked up by the Knight Bus--fortunate because the infamous Sirius Black, who blew up a street full of Muggles shortly after Harry's parents were killed, has inexplicably escaped from the inescapable Azkaban and is now on the run. There's reason to suspect he's on his way to Hogwarts to finish a job left unfinished twelve years before . . . The best part of this book for me was learning about the friendship between Sirius Black, Remus Lupin, Peter Pettigrew, and James Potter. You know what it's like to be talking to friends you didn't know until you were all adults and learn about some of their mischievous, or even downright stupid, behavior as teenagers? It's shocking, right? Because here they are, right in front of you, posing as kind, responsible, intelligent adults. It's difficult to juxtapose the two versions of these people onto each other. That's what it's like finding out that James Potter and his friends created the Marauder's Map, turned themselves into animals, and tried to tragically lure their peer, Severus Snape, to the Whomping Willow. 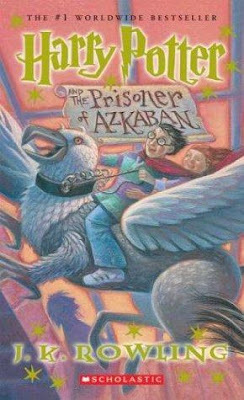 I think by this point, the reader has put James Potter up on a kind of pedestal. We know he was instrumental in fighting against Voldemort and the Dark Arts and that he even nobly sacrificed himself to try to save his wife and Harry. All of these things make us think he was always full of good intentions and high ideals. But knocking him back down to a punk teenager making poor choices with his friends turns him into someone who is much more real for his flaws. My boys' favorite part, besides the ending, was the Quidditch final. I think they'd read a whole book of nothing but Quidditch matches and commentary if there was one; they love it that much. We read the last one hundred pages compulsively, as fast as we could, because we had to find out what was going to happen. If you had been a fly on the wall during those final chapters, you would have seen me, reading calmly in the chair, while Aaron, Maxwell, and Bradley paced feverishly around the room. Back and forth, back and forth, around the coffee table, over the couches, by the chair. The suspense was killing them, and they could not contain their energy. And I don't blame them. If I hadn't been reading, I might have been wearing a path in the carpet right there with them. I loved that the ending this time was less about defeating the bad guy and more about saving Black. It was a nice change of pace. At the end, Professor Dumbledore gives Harry this bit of wisdom: "Hasn't your experience with the Time-Turner taught you anything, Harry? The consequences of our actions are always so complicated, so diverse, that predicting the future is a very difficult business indeed." And yet, if anything, I think one of the takeaways from this book is that our actions do have consequences, even actions taken many years before, and I have a feeling many of the actions in this book will have consequences in future novels. Glad you had a good experience with Book 3. My daughter was the same way - so excited to know what would happen next. We are in the last 100 pages of Book 4 (don't worry - I won't spoil it for you), but she can only take it in small doses, because it's fairly intense. We've been reading this one for months, and will definitely take a break before getting into Book 5. It's been a good experience, though! Sounds like a great read, and isn't it fun to read these long books now? I remember reading your blog when you were just starting chapter books with the boys.